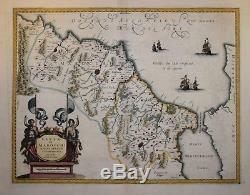 A highly decorative copper line engraved map of Morocco by the famous Dutch mapmaker, Janssonius. The present map was published in Amsterdam circa 1636. A guaranteed genuine antique map. The item "NORTH AFRICA FEZZAE ET MAROCHI REGNA. BY JANSSONIUS 1636" is in sale since Friday, May 11, 2018. This item is in the category "Antiques\Maps, Atlases & Globes\Africa Maps". The seller is "sharp340" and is located in London. This item can be shipped worldwide.